35" straight se blade with the usual English fullering. Grip of shagreen with copper wire ropes. 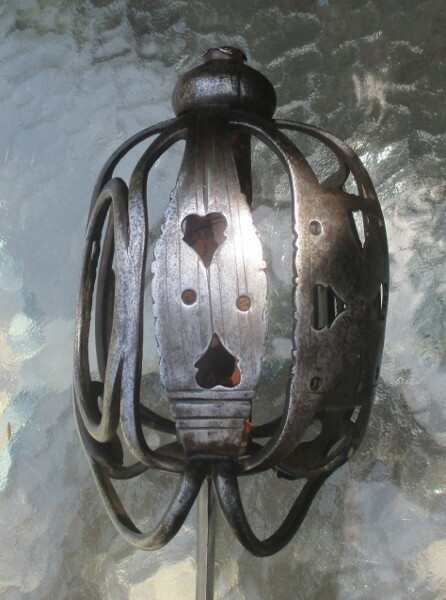 Guard is of heart form, pierced with scrollwork. 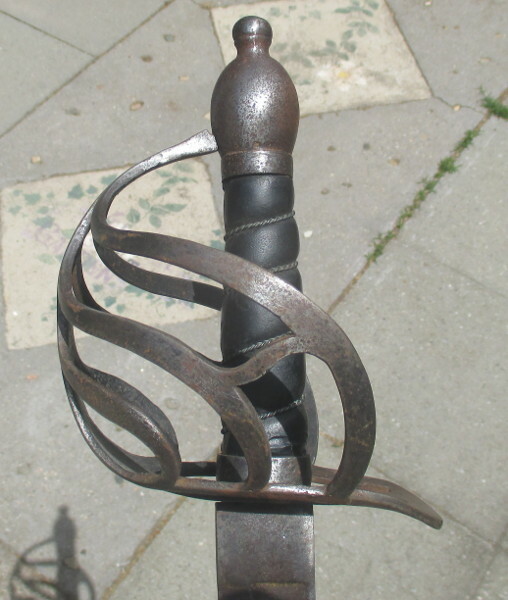 Pommel, side branches, and edge of guard are all ribbed. English, first half of the 1600s. 33" straight de blade with narrow fullers stamped "Andria Ferara"
In spite of pitting and wear, there are traces of engraving to the hilt. The grip is a restoration, but it's a decent job, so I've seen no reason to replace it. 32" straight de blade, inscribed in the fuller "IESU MARIA"
Hilt is constructed of narrow rounded bars. The grip is original, covered in sharkskin and bound with a copper wire. There is a gilt ferrule at both ends of the grip. Mazansky p. 175 show a hilt that is basically a twin to this one. English half basket grenadier's (?) sword. 30" curved se blade with single narrow back fuller; retains traces of stamped "S Harvey". 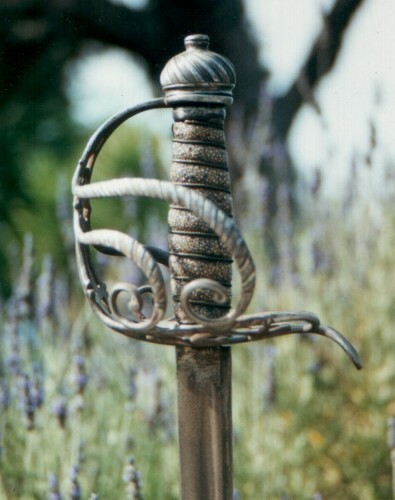 This sword appears to never have been taken apart, and while somewhat pitted, retains its original grip. Only the grip wrap and wire are missing. Mazansky p. 230 shows this hilt type, along with what is probably an officer's version. 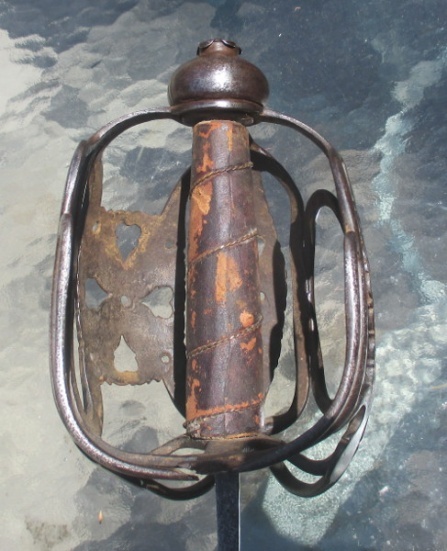 English half basket grenadier's sword, ca. 1750. 26" curved se blade with single back fuller, stamped with the fox and SH of the Harveys. Grip wrapped with sharkskin and bound with a brass wire. 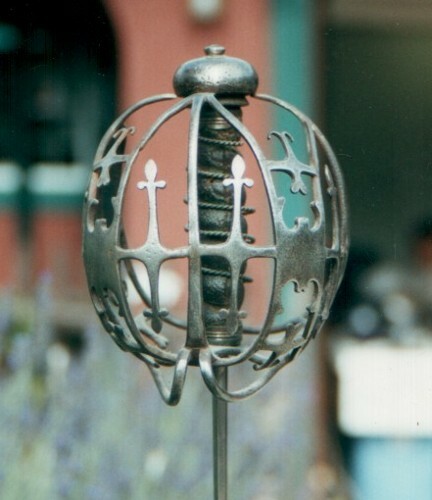 Guard is of open heart form, and the basket is composed of S shaped members. There is what appears to be an original heavy leather pad at the base of the guard. 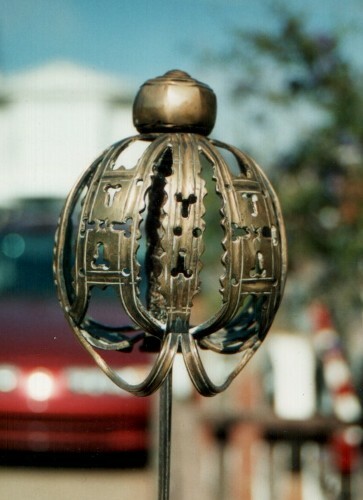 Scottish brass baskethilt, first half of the 1700s. 36" straight se blade with two narrow fullers. 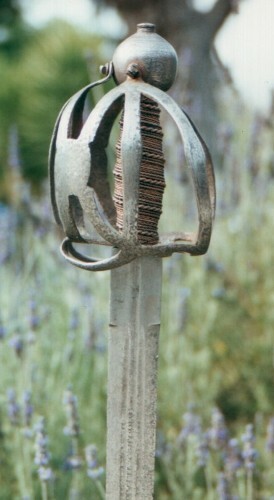 The blade is stamped on the left side with "sickle" marks. 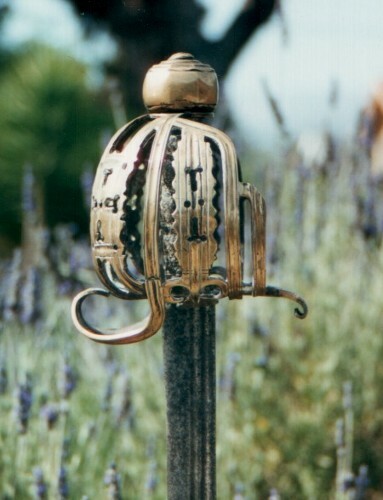 Aside from the very large pommel to counterbalance the blade, the construction is typical for one of these brass hilts. The grip is covered in leather which I suspect is modern. 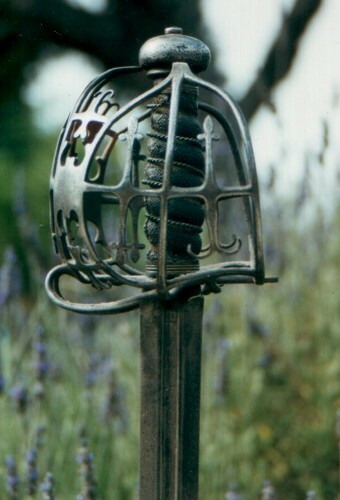 Scottish "Turcael", first half of the 1700s. 32" curved se blade, stamped in the fullers "Andria Farara". Simple basket with no filed decoration to the edges of the panels. Original wood grip core recovered by myself with fine rayskin so as to approximate sharkskin. The woolen fringe under the pommel is original (?). 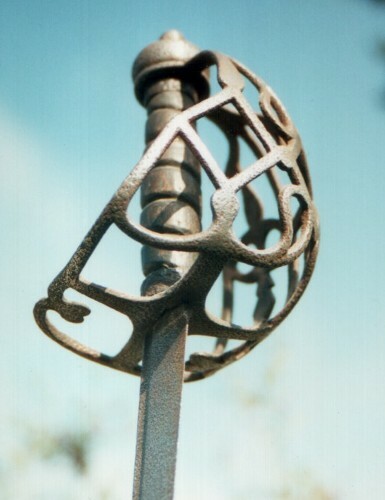 Scottish "S" hilt, first half of the 1700s. Absolutely typical basket with the S members in the rear part of the guard. Blade is 31" long, se, with triple narrow fullers. In the fullers is the maker's name, Solingen, S stamps, and a few other stamps as well. I'll take a photo of the blade markings this summer, or if they don't photograph well, I'll do a sketch. This sword is missing the grip and has never been apart. I have made a grip for it that I can open up and clamp around the tang, and this grip is visible in the photo. Someday I'll get around to mounting the grip. English, first half of the 1700s. 32" se blade with two narrow fullers, signed "Andrea Ferara". Gilt brass hilt of two solid shells, and with 3 branches on both sides of the hilt. 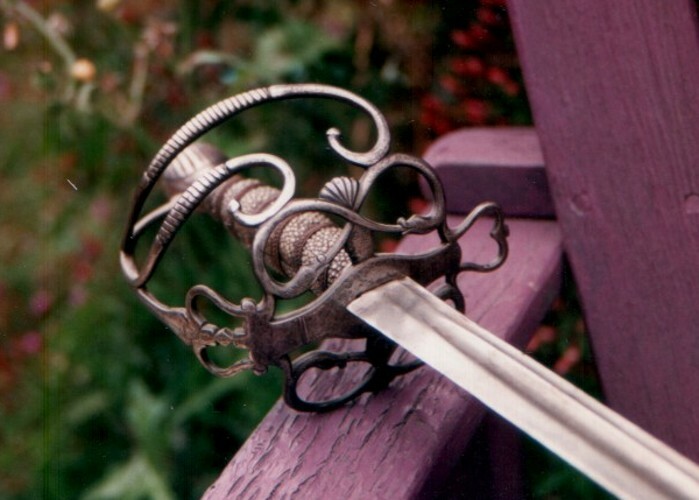 This sword retains quite a bit of its gilding, has the original grip, and does not appear to have been taken apart. English, sometime in the 1700s, but probably in the last half. 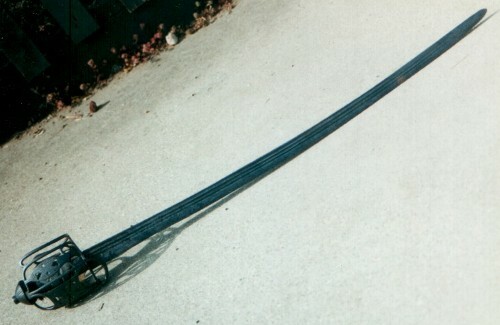 34" se blade with the narrow and wide fullers typical of English military blades. Half basket of two side branches. The guard base itself is composed of serpents, shells, and a human head, with openwork crowns at the base of the knucklebow and as a quillon. 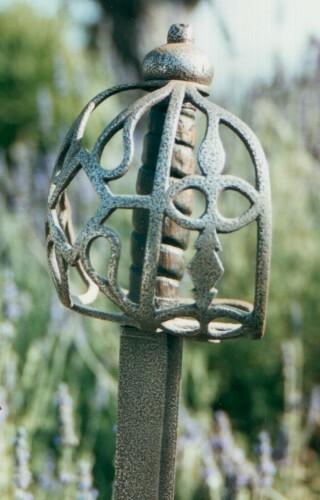 The shell motif is also found on the pommel. 32 1/2" de blade, with short central fuller. 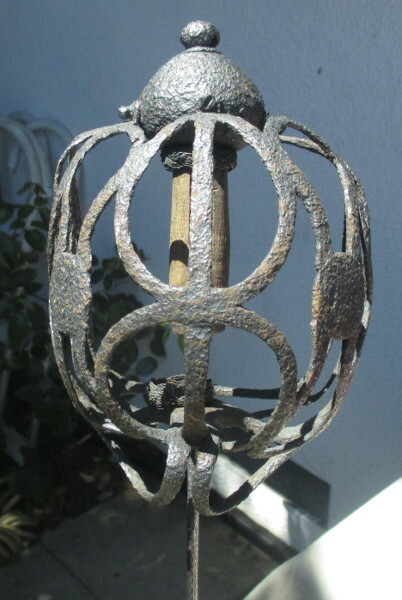 Excavated condition, but retains part of the grip and both brass wire Turk's head knots. The knucklebows are screwed to the pommel. 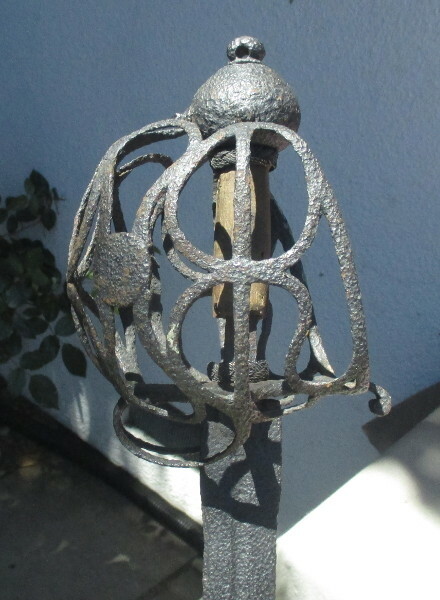 Interestingly, this basket has the feature of a screw-on capstan. Most hilts of this basic pattern are dated in the late 1500s, but I date this one to the 1620s because of the total lack of the long quillons that characterize earlier examples. That's all for now; I'll post more swords tomorrow. Exactly!!! Thanks for sharing, I am impressed with your restoration work as well. I recently had for find qualified restorers for a Japanese armor and my Persian percussion gun stock as well as some Japanese weapons. Not many people are skilled enough to do this type of work. It would be nice to see a thread on your restoration work someday. English? Scottish? Probably dates 1680 - 1720 or so. 31 1/2" de blade with two narrow fullers extending about 8" down the blade. No stamps or inscriptions are present. 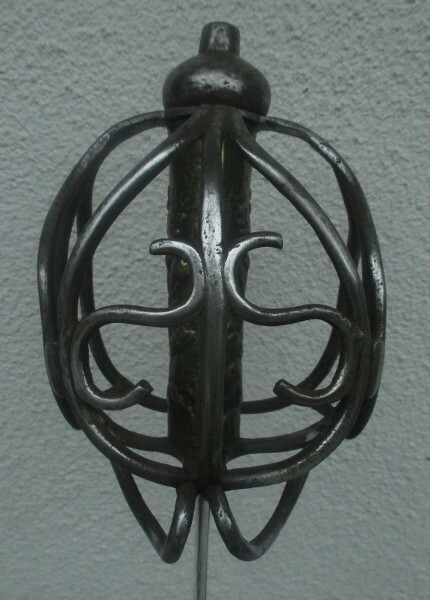 Hilt of fairly typical form for the late 1600s with plain unpierced panels with some simple filed/engraved lines. The grip appears to be original. An interesting feature of this sword is that rivets have been used to reinforce the hammer welds (see last photo). However, there's also an additional hole by the blade, and what is this hole for??? Securing the liner? 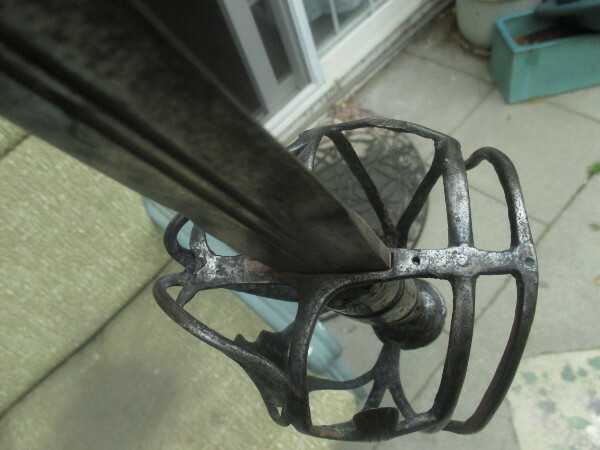 This is one of the lightest basket hilted swords I have seen. 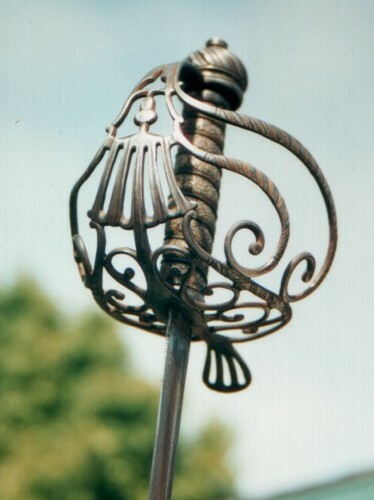 The hilt is composed of rather thin elements, and the weight of the sword is about 1.8 pounds. 30" se straight blade with a single back fuller, stamped on both sides with a running fox and SH. This is apparently a grenadier's baskethilt of the 23rd Regiment: the Royal Welsh Fusileers. The grip is of embossed brass, each side with a crown, POW feathers, the motto "ICH DIEN", and a Hanoverian horse. 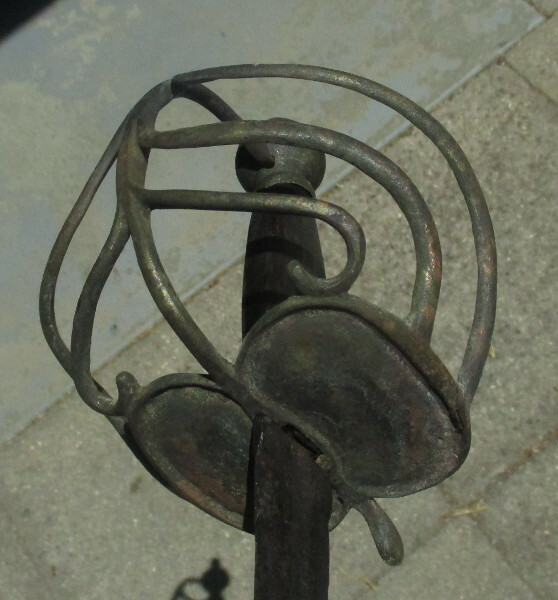 Neumann shows this same grip design on an S hilted hanger (sword 26S), which is dated to about 1745. I think that the sword shown here is a pattern used ca 1700 by the 23rd. The blade is not shortened, and the fuller ends about 7" from the blade tip. 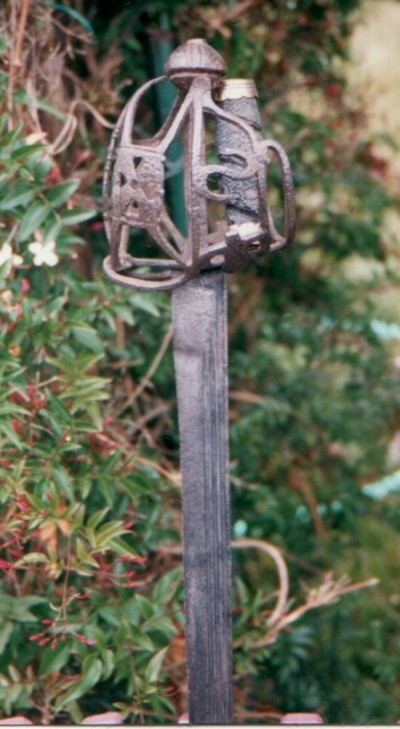 Mazansky shows several hilts of this type in his book. The first of my Mortuary swords. 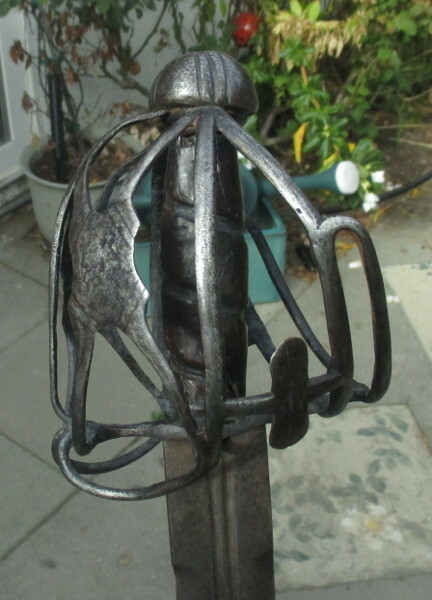 This one may not even qualify as a basket or half basket (not enough protective bars making up the hilt), but since Mazansky covers Morts in his book, this sword is not inappropriate for this thread! Mid 1600s in date, with a 32 3/4" de blade inscribed on one side "+ SOLIDEO +" and the other side "+ GLORIA +". 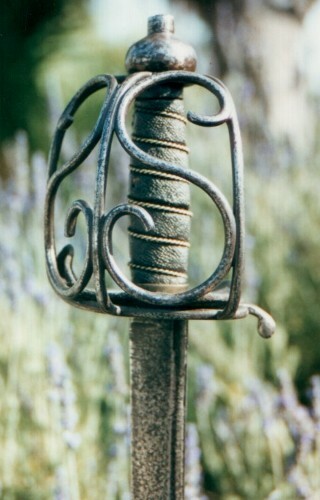 What makes this sword of interest is that it has a thumbring, a feature not found commonly on English swords. 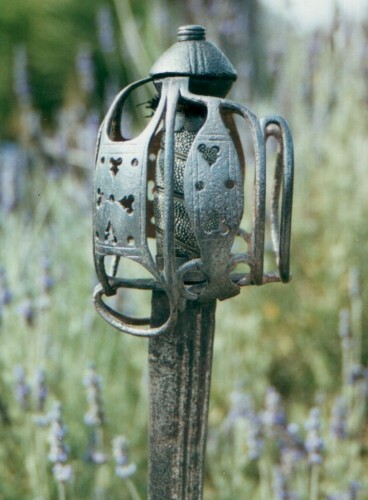 The hilt decoration is composed of four grotesque faces, and foliage with some sparse piercings. The grip is one of my restorations, and the diagonal lines seen in places on the blade are artifacts of where some idiot in the past used an angle grinder on it. Here's another brass basket, ca. 1740s. 30" de blade with single shallow fuller. This sword is similar to one that I posted earlier, but this one is in semi-excavated condition. 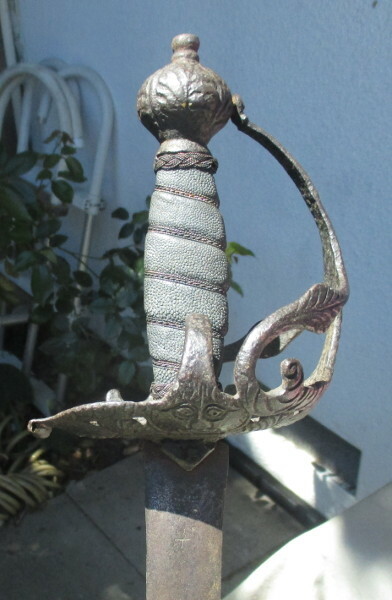 Purchased on eBay at least a decade ago, this sword was found in an old sewer, according to the seller. 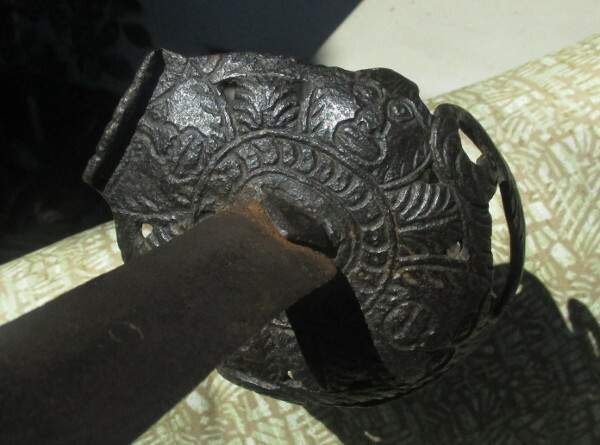 The brass is uncorroded but oxidized, the blade is not too badly pitted, but the blade tang (softer iron) had been pretty much eaten through in places, especially under the pommel. The tang broke at that point, so since as the sword was apart, I made a replacement grip, repaired the tang, and reassembled the sword. 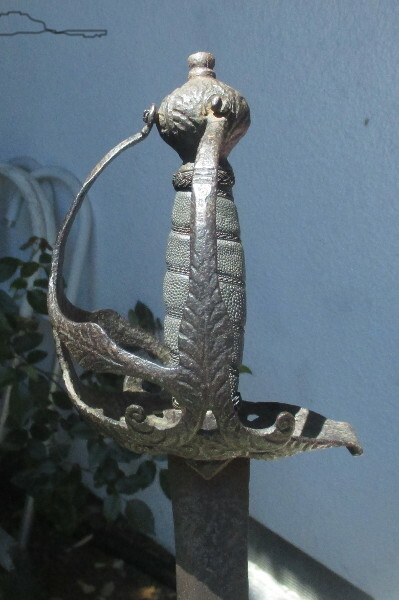 This sword hilt exhibits some serious assymetry, which I have tried to show in the photos. The sword is made for a right handed person, and one's knuckles bind with the side knucklebow if one tries to use the hilt left handed. The grip is a modern replacement which I need to redo one of these years. 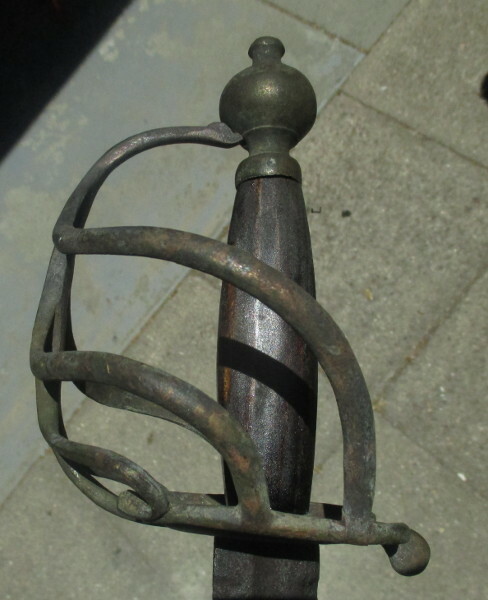 I didn't take a side photo of the hilt as it's a rather common and generic English cav basket of the mid to late 1700s. 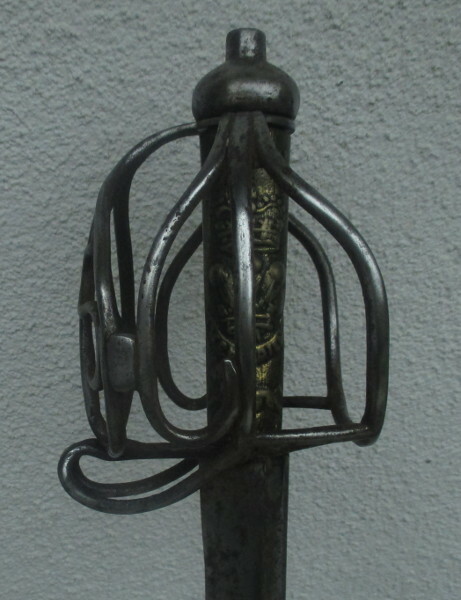 English 1788 pattern heavy cavalry sword. 35" shortened blade, with a single wide fuller. 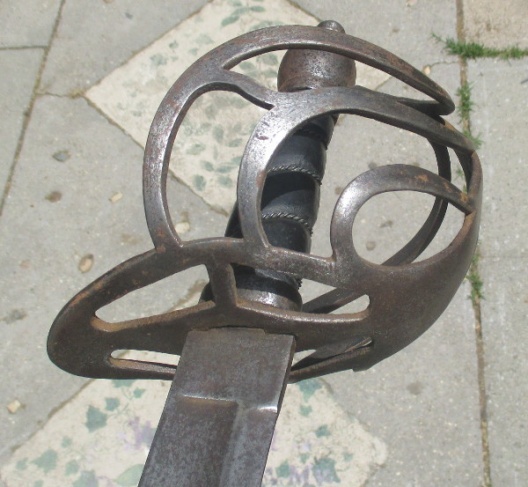 Typical massive sword (grip base to pommel capstan is about 7 1/4") of this pattern based upon a slotted guard with 3 side branches to both sides. 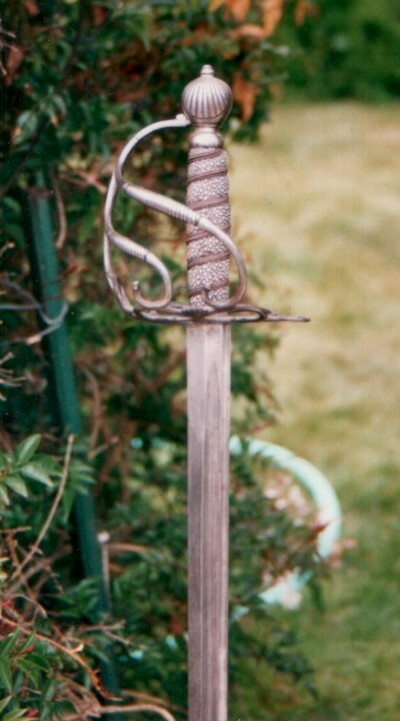 Sadly, there are no marks anywhere, but it's still a good example of this type of sword. The grip is one of my restorations.